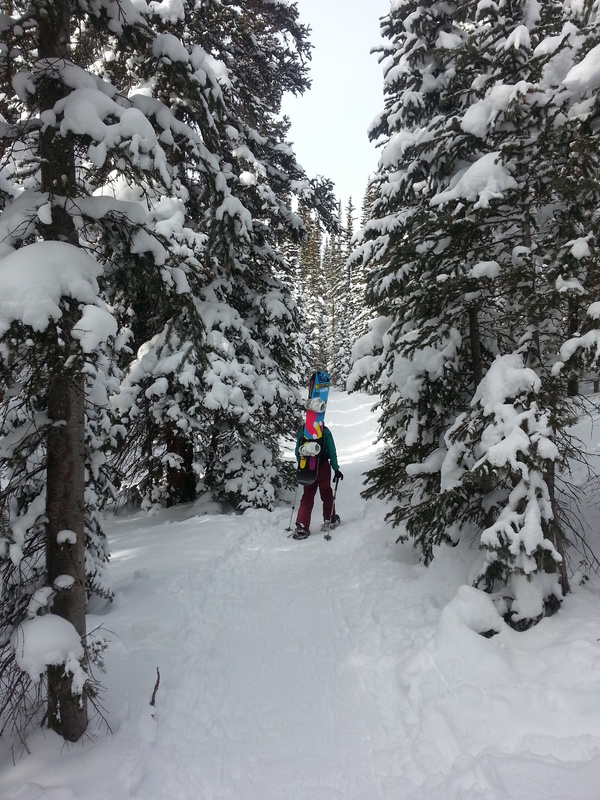 New Year means new hobbies and with that I welcome you to my latest attempt at blogging– Teresa and/or Emerson’s SemiGnar on Colorado Adventures! 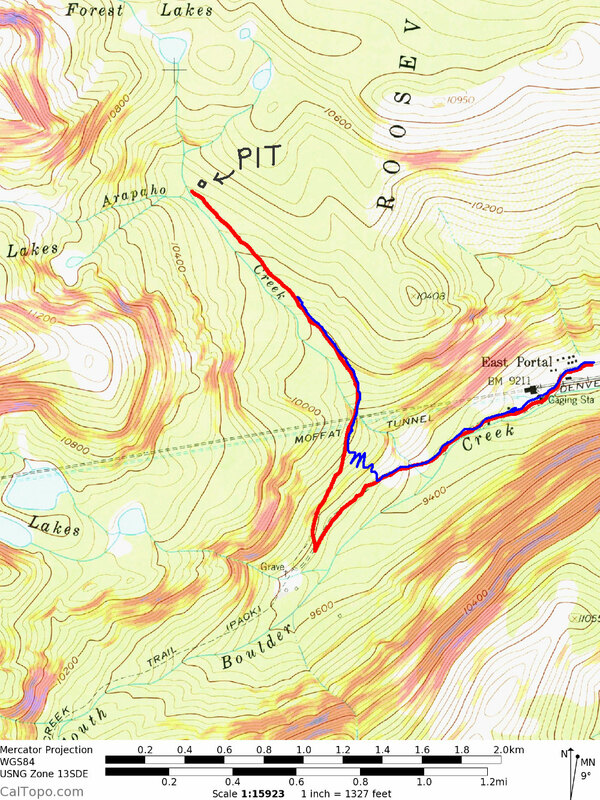 To kick things off, the first entry is about our maiden solo backcountry venture at Moffat Tunnel. Ascent in red. Descent in blue. The goal of our trip was to practice the planning and decision making skills we learned in our AIARE I course. We started at the trailhead around noon, a little later than ideal due to the unforeseen shortage of rental snowshoes at REI but still within our approved time window. Pro tip for future visits– Come prepared to spend as little time in the parking lot as possible, or else the chilliness there might fool into overdressing, which you’ll quickly regret like we did. Having started in the hike in 4-5 layers, we were both down to two layers within the first half mile. The trail up was beautiful and relatively stress free. There are a few steep bits and stretches of persistent hills but nothing particularly difficult. 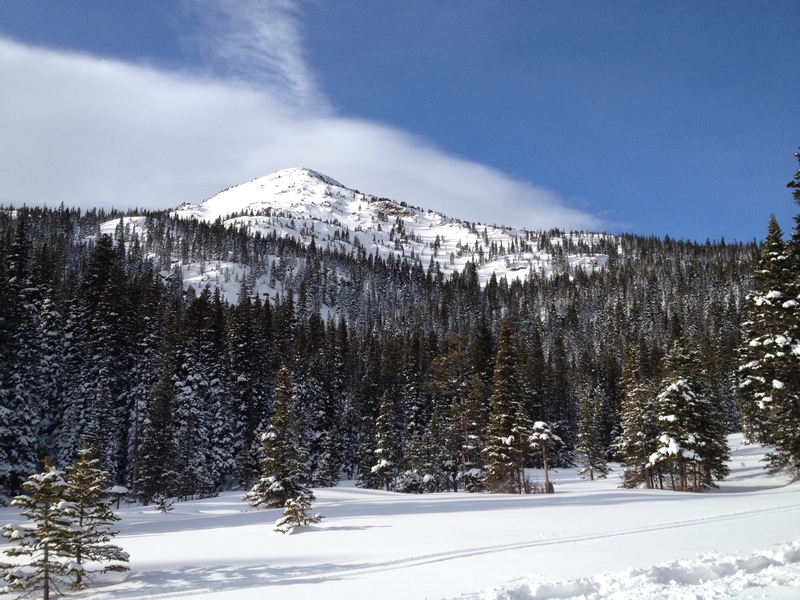 At a very leisurely pace, it was about 1 hour from trailhead to the eastward bridge crossing Arapahoe Creek and another hour to the creek junction at the end of the map marked trail on snowshoes. The creek junction area turned out to be a relatively flat meadow. After brief recon adventures confirmed that we couldn’t build a backcountry booter to play pretend Art of Flight, Em and I decided that building a snow pit and conducting the snowpack tests we were taught would be the most valuable use of our remaining hour before our turnaround time. 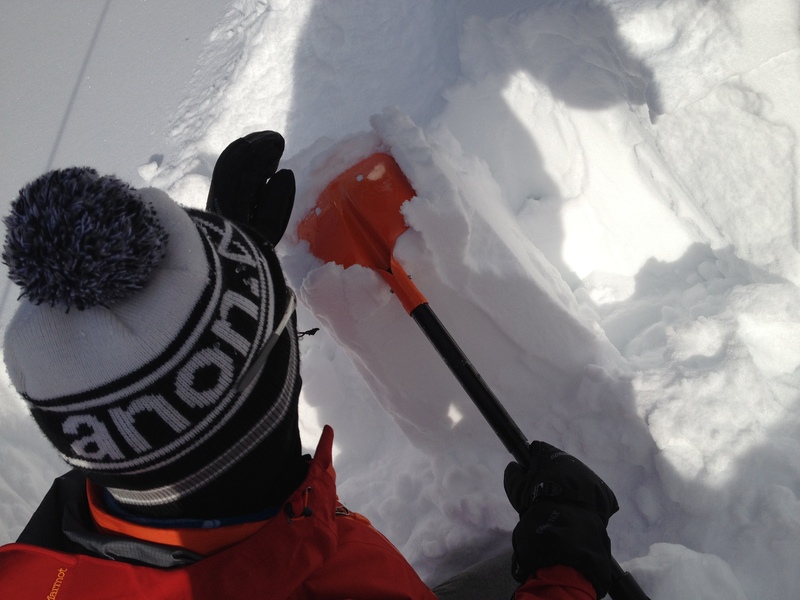 The probe indicated the snow was 85cm deep and so we dug… and dug… and dug. A pit eventually formed and we made our observations in our best attempts to be safe and responsible backcountry venturers. Emerson pat-testing down that column. It was soon time to go, as hinted at by the setting the sun and my numb sausage-fingers. I could feel that the temperature had dropped nontrivially since we began. The peak wrapping the horizon was marked by a few victorious squiggles, clear reasons for us to come back. We followed the trail back down until we found a clear down slope because, well, life isn’t so easy for snowshoeing snowboarders. In non-record breaking time, we switched out our gear and strapped on our snowboards. The trail afforded some surfy traversing until we crossed the Arapaho Creek bridge (where tracks down the creek tempted us but we said NO! That looks scary!). We traversed a little bit more until we found a nice, less tracked out area and dropped in, taking turns taking turns (bwahaha) until we reached the trail. A painless skate back to the parking lot and toasts of frozen waters and sandwiches ended our successful first backcountry adventure.